In 2015, weekly sessions were held at Invergordon Museum to explore Invergordon during World War I. Sessions were run by Archaeology for Communities in the Highlands (ARCH) for a project funded by the Heritage Lottery Fund First World War Then and Now programme. We were lucky to have access to naval plans from the period, and when combined with the map evidence of the 2nd edition Ordnance Survey, a large number of old photographs, documentary sources, detailed aerial photographs from World War I and 1930, and walks in the town we were able to chart some of the changes which occurred during the period. The results of the project were launched at an Open Day on 17th October 2015. Primary school pupils contributed to the display, and the trail leaflet produced by the adults was launched. The leaflet is available locally and on the ARCH website. A geocache has also been hidden along the trail (see www.geocaching.com). Binders with further information have been deposited in Invergordon Museum, Invergordon Library and with both primary schools. Details about sites - over 300 from WWI as well as over 200 later ones - have also been submitted to online heritage databases: the Highland HER and Canmore. The deep harbour which makes Invergordon so attractive to cruise liners at the moment was one of its big attractions to the military. The landowner, MacLeod of Cadboll also invested to develop the harbour. The fleet came for the first time in 1863, and spurred further expansion of the harbour. The detailed 1904 2nd edition OS map shows a thriving town, with a ferry slip, two piers, railway lines going north as well as a branch line leading into the large bone mill. As the navy increasingly used the harbour, oil tanks were built, 10 just before the war and a further 31 during World War I. 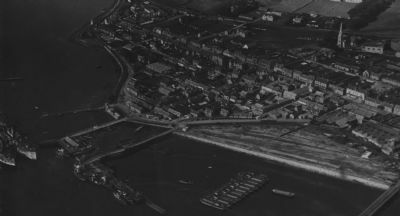 With its good harbour and rail connections Invergordon had ideal facilities to become a major naval port. Socially and physically Invergordon was transformed by the war. There was an army camp holding at least 2000 men (Cameron Highlanders 3rd Reserve Battalion) to the north above Cromlet Drive, providing training for soldiers. Over 4,000 dockyard workers fixed the naval ships which used the port – most ships had a 10 day turnaround. Estimates suggest the population swelled from around 1100 before the war to around 20,000. Russian migrants, military and civilian, came through the town. Towards the end of the war Americans were in the area, based at Dalmore (after the whisky had been relocated), where they assembled mines and then transported them to Invergordon along a specially constructed railway line which ran where the present road is. Many of the buildings in Invergordon were taken over by the military, as offices, stores or large workshops, and even the bakery and post office. But many other new buildings were constructed, including accommodation for dockyard workers and army personnel, two hospitals, three police quarters for the Metropolitan police securing the dockyard, generating plants to cope with energy demands, YMCAs (one for 2500 men, one for the Americans and one YWCA for female dockworkers), churches and entertainment venues such as cinemas and theatres. There was even a new pier – the Admiralty pier, now used for cruise liners – and much of the area near the shore was reclaimed. Such a massive expansion required other works, including numerous railway sidings throughout the town, paved roads and pavements, sewage works, pipelines for the oil, and a network of power lines. Two floating docks were installed to allow ships to be repaired and fitted, with railways lines on the piers linking the large workshops on shore. Defences were built on the Sutors, the hills where the Cromarty Firth joins the Moray Firth, and a boom was erected across the Cromarty Firth. Other defences surely guarded the town, though none survive. After the war the fortunes of Invergordon declined. Most of the huts and fittings were sold. In the 1920s the popular venues of La Scala cinema (which held 600) and the Empire Theatre burnt down, some think for insurance claims because they were no longer profitable. But the fleet still visited after the war, and in the 1930s more oil tanks were built. The town again expanded during WWII, but on a smaller scale, with the navy refuelling ships and the RAF supporting seaplanes.